Would I scare you if I said that tiling is a good beginner renovation project? I hope you aren’t scared because tiling is one of those projects that you can really break down and tackle step-by-step. Tune in to today’s episode, Tiling Tips for Walls, and come away ready to get your DIY on with a tile makeover. Suzannah and I both believe that tiling can really be a great DIY project. That being said, there are some things that you can learn through today’s episode that will set you up for success. We cover design considerations, such as: how far up the wall are you planning to tile? Are you tiling to the ceiling? How are you planning to lay the tile? 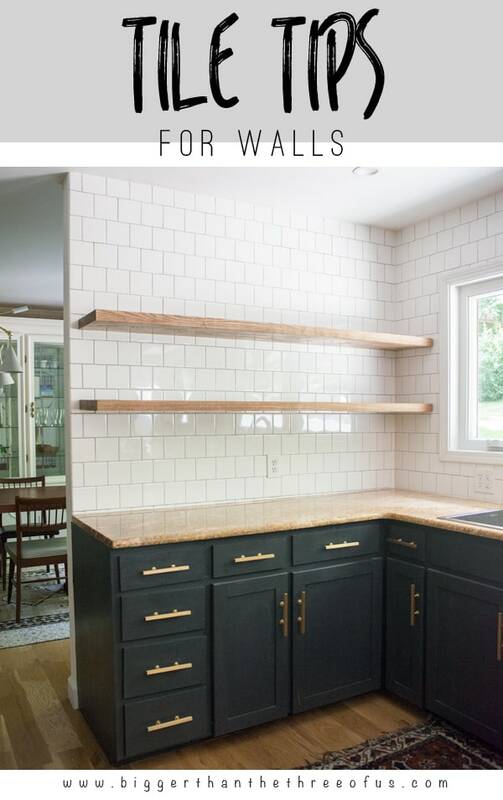 If you are planning on tiling a large space, your time and money commitment are definitely going to be more than someone who is just tiling a small backsplash area above their kitchen cabinets. Also, certain tile patterns, such as herringbone, can be more time consuming because of the amount of cutting. Those design considerations shouldn’t scare you off, but are important to think through when planning your project. My beginning in tiling the kitchen. We’d love to hear your questions and thoughts! Join our Facebook group here and email us at yourhomestorypodcast@gmail.com. Or, if you are new… check out all the podcasts that we’ve done on the Your Home Story Podcast page.